Chiaki Kurihara handles things “pirate-style”. 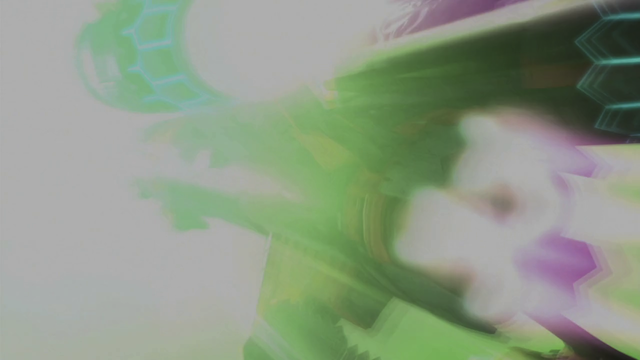 Episode 18 ends the third major arc of Mouretsu Pirates (Bodacious Space Pirates). 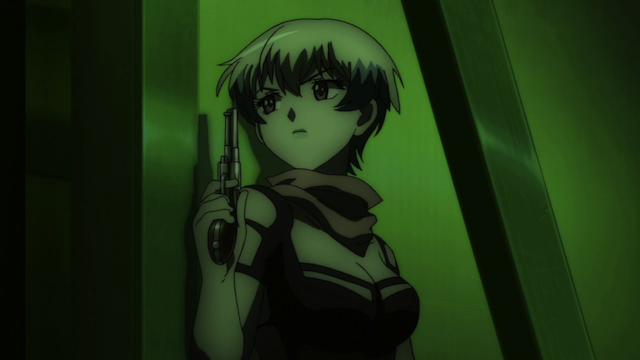 Frankly this third arc hasn’t been the best of the series, even though it still had some elements that were interesting. I liked the way that it used characters we already knew from earlier arcs, instead of introducing a lot of new characters, for instance. I do wonder how they plan on using that newly acquired ship they got. And I’m pretty confident that it will be used at some point. This show never drops something like that into a story without using it fully. It’s gotten way too much attention to be a ‘throw-away’ ship. If it follows established practice, next week Mouretsu Pirates will be another transitional episode. I really hope the final arc is a strong one, and that this show ends well. 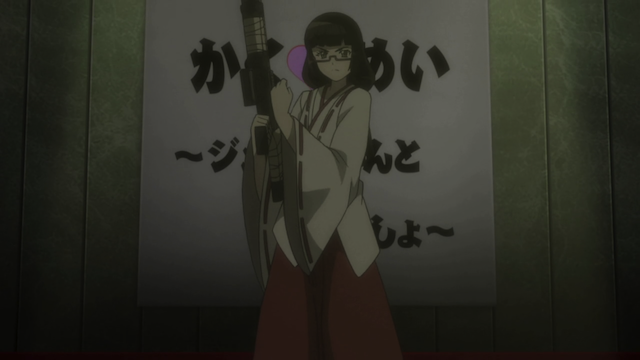 Chiaki Kurihara in Miko outfit with gun. Don’t ever get on a woman’s bad side. The bride wore white. Jenny Dolittle takes marriage vows very seriously. Episode 17 of Mouretsu Pirates (Bodacious Space Pirates) pulls another twist in the storyline. 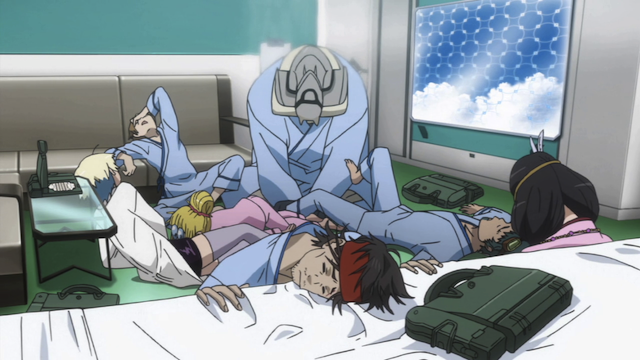 While the regular crew of the Bentenmaru are still hospitalized, an unforeseen event brings a shooting war to the substitute crew. Meanwhile the aniblogiverse is heating up over a little PDA. 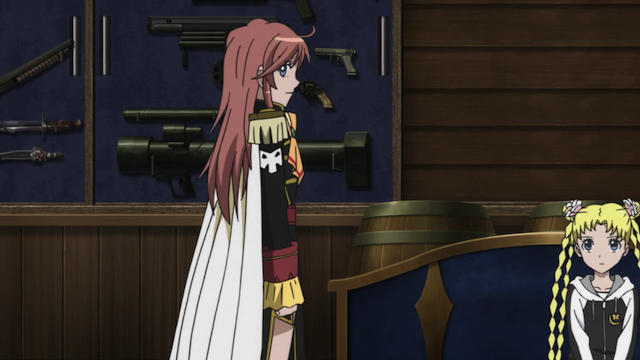 Misa Grandwood discovers a problem on the Bentenmaru. 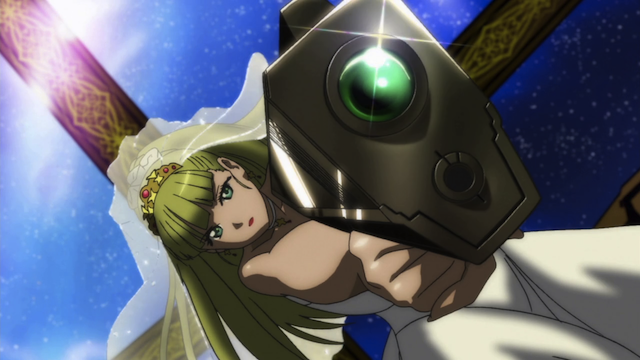 Episode 14 of Mouretsu Pirates (Bodacious Space Pirates) kicks off the third arc of the series. 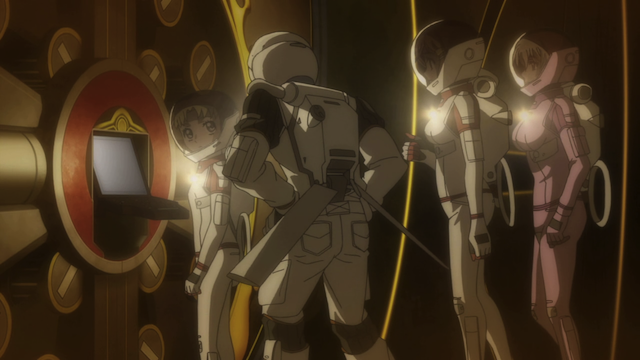 A problem comes up that threatens the very existence of the Bentenmaru, and Captain Marika cannot depend on any of her crew to help her resolve it. A lot of people don’t like the methodical pace of this series, but I thought this was a good set-up to the new arc. It also gave us an opportunity to learn more about some other elements of the setting.